Burning your hands or arms in the kitchen can be very painful that’s why oven mitts are one of the essential items to have. And if you’re looking for the best oven mitts, then you’ve come to the right place. The perfect oven mitts are very useful in the kitchen and can resist high temperatures, giving your hands and arms full protection. So, to help you make the right choice, we researched the best oven mitts on the internet and came up with reviews for these. We will also discuss the best material for maximum heat resistance and protection while comfortably wearing the gloves. How to Clean Your Oven Mitts? How to Choose a Good Oven Mitt? Grill Armor Gloves is one of the toughest oven mitt we can find because of its extreme heat resistance of up to 932 °F or 500 °C, ensuring to protect your hands despite the high temperature. These are EN407 certified gloves that gives the most resistance to heat and flammability. Its resistance to flame is tested and it is insulated with M-aramid and P-aramid fabrics which are the same as Nomex and Kevlar. These materials do not catch fire easily or melt near an open flame. So, using this product keeps your hands away from accidental burns and heat. These gloves are great for any cooking, especially for grilling and baking. It comes with a super-grip silicone pattern that will allow you to hold hot and heavy items with ease. It is made of thick yet lightweight 100% cotton for comfort and protection. These oven mitts are machine washable so clean up is very easy. 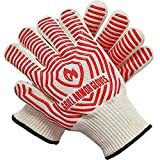 Grill Armor Gloves is an excellent option if you want an all-around product. It’s the best oven gloves with fingers and it’s great to use for grilling and handling hot items directly since it doesn’t burn or melt easily. Some users even use this for their fireplace and move the logs directly without burning their hands. Also, for any reason you are not satisfied with the purchase, you may ask for a full refund. We found out that the refund rate is minimal and usually is due to minor product default, though. The Black Silicone Oven Mitts by Frux Home and Yard is made of 100% FDA-approved silicone that adequately protects your hands when cooking. The inside has a soft quilted liner that is made of 50% cotton and 50% polyester, adding more protection to your hands while giving comfort. These silicone mitts are great for handling hot items and are both heat resistant and waterproof. It can resist up to a temperature of 482 °F or 250 °C and it won’t burn your hands even when there is steam or hot water. The patterned silicone outer allows good grips when handling items during cooking. This ensures that your pots or pans won’t slip from your hands. The mitts have great length, protecting your hands up to your wrists to lessen burns when you reach inside your oven. Caring for the mitts is easy and it’s as simple as washing the outside with warm soapy water. It has an attached loop so that you can hang it up to dry. Overall, these Frux silicone mitts are an excellent buy that gives maximum protection. We love the outer silicone material and the inner comfortable cloth lining. It’s handy for cooking, baking, and as a pot holder. You can even use it as a hot pad. The seller guaranteed 100% satisfaction otherwise full refund with no question asked. 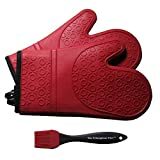 The Big Red House Oven Mitts may seem like regular oven gloves at first look but it is made of quality material that protects you when grilling, cooking, or baking. It is made of recycled cotton infill and terry cloth lining to make it comfortable. And it has FDA-approved and BPA-free silicone stripe patterns for good grips when handling objects. The multiple layers protect your hands from high heat and the combination of cotton and silicone adds maximum flexibility and protection. The total length of the mitts is 12.5 inches, ensuring that your wrists and forearms are also protected. The gloves can resist up to 480 °F or 249°C. So, you won’t have a hard time reaching into your oven. Cleaning the mitts is also very easy as it can be machine washable. You can hang it to dry after washing because it has loops which you can attach to a hook. 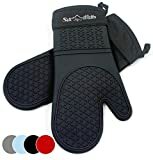 This product is similar to the Calphalon oven mitt but this one is owned by the Big Red House which is a small family-owned company who started with selling soup locally. Because of that, they know how a good oven mitt should function. Overall, a lot of users are very satisfied with these mitts. It works well and doesn’t burn when handling hot items. These have a nice thickness for overall protection but are still maneuverable. Also, the silicone stripes add a nice touch for great grip. This product is 100% satisfaction guaranteed or otherwise full refund. The Silicone Oven Mitts by Triumphant Chef is another product made of 100% FDA-approved heat resistant silicone. The gloves can hold up to 450 °F or 232 °C. This is considered a low temperature compared to the other mitts, but it can still provide maximum protection for your hands when baking or cooking. The silicone outer has a raised pattern for good grips on whatever you are holding. It is waterproof and oil proof so you are protected from hot oil spills, steam, boiling water, and other hot liquids. The inner is made of 100% cotton-polyester fabric that gives cushion and more heat protection. This is the best oven mitts for small hands because it is one size fits most, meaning everyone in your whole household can use these mitts. Even the tiniest hands can firmly grip hot items and move them around with ease. Just like other silicone made mitts, the outer shell is easy to clean and only requires water and soap. It also has a cloth loop so you can hang it dry after washing. Overall, this product is excellent and well-loved by many users. It is one of the best oven mitts on Amazon with high satisfaction rating. The only downside to this is its low temperature threshold but it proves very useful for regular kitchen cooking and baking. Also, if you buy now, the purchase will come together with a bonus silicone brush. 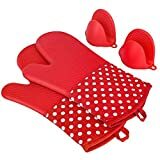 Kedshum Heat Resistant Silicone Oven Mitts is somewhat similar to the famous OXO Good Grips Oven Mitt but at a much affordable price. While it doesn’t meet the same maximum heat that OXO can tolerate, it can resist up to 482 °F or 250 °C. This glove is perfect for serving, baking, cooking, and holding hot plates. It also comes with a bonus mini pinch silicone grips that are heat resistant up to 392 °F or 200 °C. So, you get an extra pair of oven gloves. The outer top shell is made of silicone material with a honeycomb pattern that is an anti-slip design. It ensures a secure and firm grip even when holding hot pots or pans. The inside is made of a quilted super soft cotton-polyester material that adds comfort when wearing the mitts. The gloves are extra long and have a length of 13 inches to protect your fingers, hands, and wrists from burns from far-reaching grease spatter and oven burns. This is an excellent product if you want something to use at home. Although it can only be heat resistant up to a very low temperature compared to other mitts, you can also use it for handling items that are too cold to hold. The Kedshum mitts are worth the price and work well for its purpose. We go through hundreds of products listing at Amazon and also study the ratings left by previous buyers to find the best oven mitts for you. Besides that, we also calculate the overall net customer satisfaction (NCS) grade because we want to see how happy is the previous buyers with their purchase of the product. From our finding, we can say that Frux Home, Triumphant Chef and BIG RED HOUSE are the best kitchen glove and mitts brands. These brands are popular and received many excellent ratings for their products. Also, the Frux Home and Yard Black Silicone Oven Mitts, BIG RED HOUSE Silicone Heat Resistance Oven Mitts and Triumphant Chef Deluxe Quilted Liner Silicone Oven Mitts score favorably for the ratings as well as the NCS grade compare to the rest. We believe that you would find these kitchen glove and mitts a good buy too. Oven mitts are gloves that are made explicitly for kitchen use. These are made of thick, heat resistant material that protects your hands up to your wrists from heat to avoid unwanted painful burns. It lets you comfortably hold and handle hot cookware without burning your hands. Some better quality mitts can let you hold burning hot cookware and plates longer. Therefore, when buying an oven mitt, always make sure it is well constructed and not made with just cloth. All the product reviews above are carefully selected good quality mitts that you can buy, though. Cleaning your oven mitts can depend on what type of material it’s made of and what the manufacturer’s instruction is. But in general, if it’s a cloth type, it’s safe to hand wash it to remove the stains, and if it’s a silicone type, washing it with soap and water will do. Most mitts come with a cloth loop so that you can hang it to dry. The material of your oven mitts should be heat resistant. Traditional mitts used to be made of cotton but do not give much protection and heat resistance, unlike the silicone one. There are many oven mitts now that are made of silicone material because it can resist up to high temperatures up to 932 °F or 500 °C. Some more modern cloth oven mitts are made with sturdier flame-resistant fabrics that are similar to Kevlar. Of course, you will use your oven mitts every time you cook, so you need something that is durable and will withstand usage. Choose gloves that have a quilted interior made of the cotton-polyester material because cotton tends to lose its shape, but polyester blends make it sturdy. Choose a pair of oven mitts that are flexible and can give you comfort with use. Gloves shouldn’t be too hard so that you can easily maneuver and move freely. There are gloves with a five-finger design that will let you move your fingers easily. Gloves should be easy to clean since you’ll be using it often and you’ll be handling food. You want to remove stains to avoid molds and bacteria build up easily. Make sure to follow manufacturer’s instructions on how to clean your gloves so that it will last longer. Some mitts are machine washable but hand washing is more advisable to remove stains and dirt effectively. The oven mitts you choose should have some form of secure grip. Some have silicone linings or patterns that ensure a good grip when holding cookware. Just like any other item you are planning to buy, the price should also be a consideration. Having a high quality item shouldn’t have to be expensive. But having an affordable one shouldn’t compromise quality. Always review other features to make sure that you’re getting what you’re paying for. Our list of the best oven mitts is definitely helpful in choosing the perfect product that will help and protect you in the kitchen. We particularly like oven mitt from Frux and Triumphant Chef. The product makes gripping and holding cookware and food easier. The silicone touch adds a firmer grip and added heat protection. It’s an overall great product with unique features for a very affordable price.